There were so many points while reading this book that I realized it was so unrealistic and so dramatic. My gosh, SO DRAMATIC. 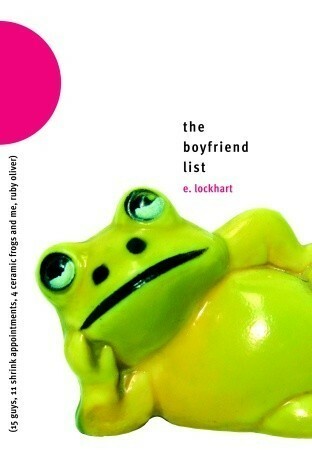 The Boyfriend List follows Ruby through the telling of stories of past boys she’s liked or dated. She starts having panic attacks and her parents decide to send her to a therapist. This therapist tells Ruby she needs to sort through her problems, and most of her problems are stemming from boys…. so she makes a boyfriend list. This was a fast read, but so so dumb. This girl is supposed to be 15, and I don’t know if I was just an abnormal 15 year old, but I did not think about boys this much. I’ve never been boy crazy, so I totally could not relate to this book. It was just so ridiculous sometimes! She lost friends over having crushes on different boys. Come on. I also had a problem with the fact that she was calling them panic attacks…. These were definitely anxiety attacks because there was a definitive stressor causing the situation. They weren’t just randomly striking. This is just lack of education on the author’s part. I’ve had anxiety attacks and it’s similar to how she was describing these panic attacks she was having. I think when you’re talking about mental health you should actually be factual with your information. There were way too many characters with not enough description for any of them. If you’re going to have that many characters, at least give some sense of background information. Some of the characters just had names that made no sense to the context of the story. Another thing. If the character adds NOTHING, then the character does not need to be there. Some of the friends listed in this book made no sense because they added nothing to the plot of the story at all. I’m just confused at the boys she chose over others. She had a cute boy from another school that was super nice and liked her, but she just ignored him. She was friends with a nice boy from art class who always complimented her, but she was mean to him. Umm. I’m just confused why she chose the guy who didn’t even really like her and then ended up ditching her for her best friend. I think that books like this give such unrealistic expectations to young readers. I picked this up because I enjoyed We Were Liars by E. Lockhart. I liked the writing style of that book because it was poetic and there was something deeper to the story, but this just showed very unhealthy relationships. The relationship with the only “real” boyfriend of this book was so so so unhealthy. It reminded me so much of my own ex-relationship because the boy dictated everything and just assumed it would be fine no matter what. It isn’t healthy to show teenage girls that that’s a “normal” relationship! That isn’t how you should be treated. Your boyfriend should want to hang out with you and not make fun of you in front of his friends. The family dynamic in this book was so whack. At one point the therapist brought up that Ruby is just following the actions her mother takes in her marriage. don’t tell a 15 year old girl that her parents are fighting and have an unhealthy relationship. if you show the mother in the unhealthy relationship, make it change by the end of the book to prove… something. That women can make their own choices and not be controlled in relationships. Don’t just let it continue on. Don’t bring it up otherwise! I think a lot of situations in this book should have been handled much differently. I don’t think that I’ll pick up the next books in the series, but we shall see. They’re short and this first one was easy to read.